Mores Creek Summit Backcountry Skiing: Back to Mores Creek Summit! After 15 months of absence from Idaho, it is real good to be back to Idaho City and to ski tour the Mores Creek Summit backcountry ski area! 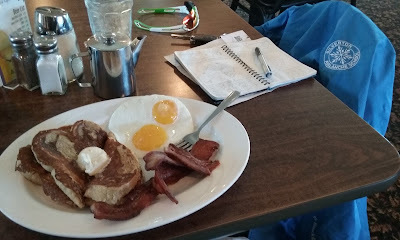 The special at Trudy's, no better way to work on the Blue Book entries. Before heading up to MCS pass to ski tour, I had visit Trudy. And I mean not only stopping at Trudy's Place and having the perfect breakfast, but visiting with Trudy. Trudy is a dear friend, and its has been many years I have been visiting her restaurant business. Besides, her desserts are the best to be found anywhere in our galaxy. It was an emotional reunion after such a long time. We talked for more than an hour, and she got me up to speed about the changes around Idaho City. I was surprised to hear about the molybdenum mining being plan to take place at Coulter Summit, west of Wilson Peak. 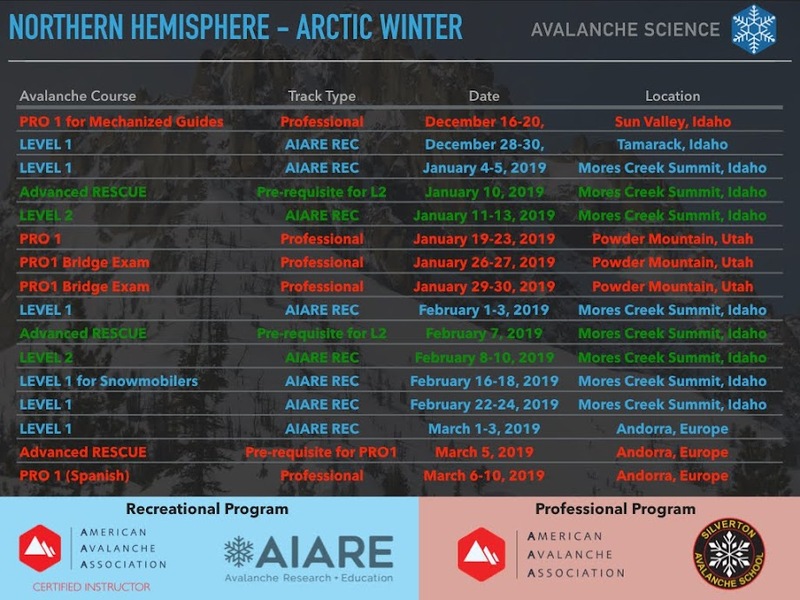 The last two arctic winters I have explored the French, Spanish, and Andorran Pyrenees, the Northeastern Swiss Alps, as well as the San Juan Mountains in Colorado while doing snow research and teaching avalanche courses. And during the austral winters, I have continued to explore the Argentinean Patagonian Andes as well as the Chilean Araucania. I can say without doubt, that I have not found any place in the northern or southern hemisphere that can begin to compare to the wonderful tree glade skiing of Mores Creek Summit. Friday March 18th was a bluebird day, with light winds, temps below freezing, and strong solar radiation. Air temps went from -4 to 0 degree Celsius throughout the day. Indeed a warm day. Snow surfaces were covered by absolutely beautiful surface hoar two dimensional plates, and near surface 3-D hexagonal crystals. It was not hard to find graupel at the snow surface mixed with SH and NSF snow crystals. The snowpack was deep and the coverage was superb. At 7500' the depth exceeded the 3 meters. The generous snowpack has opened many ski lines unavailable for several years. The views from the Freeman ridge have not changed - They are spectacular! It is always breathtaking to see the vastness of Central Idaho Mountains, with the Boise Mountains and the Southern Sawtooths covering the skyline from the north to the southeast. Southern Sawtooths in the distant horizon. The skiing did not disappoint, with a 20 cm of soft 'Diurnal Recrystallized' snow at North and Northeast aspects. But any deviations past the 60 degree magnetic compass bearings had a very instruktional (k is q deliberate spelling for some my old friends) breakable crust. Tracks at Southeast aspect left a day earlier by another skier - breakable crust ... ughhh! Conditions were generally stable, with two layers of concerns identified; a graupel layer at 30 cms, and a wet polycrystals interface at 65-70 cm depth. Test results produced moderate results (CTMQ2(RP)) at the graupel layer with no propagation propensity (ECTN). No evidence of instability was identified, with only dry loose skier triggered sloughs at steep shots. Second easily identifiable layer from the surface down, is the 4F hard wet polycrystal layer under a Pencil hard 10 cm crust. Very likely Saturday warm temps and strong solar radiation have impacted snow, but nights have been cool. It should not be hard to find northerly aspects at MCS (Pilot and Sunset) where skiing will be fun! I noticed a skin track smacked in the middle of Freeman middle meadow. Not a big deal. I understand whoever get to put the uphill track can do it anywhere he wants. It is likely that the skin track was justified based on a pre-existing crust. However, the crust was gone from the meadow by Friday due to near surface faceting processes. Next time - Can we try to build the uphill tracks were we do not impact skiing terrain? THANKS! Freeman middle glade with uphill track right in the middle of it. Ahhhh .... It is good to be skiing in Idaho again!